This is the fifth post in a series that will eventually comprise an activity-based, unit pioneering program curriculum. V. With the square lashing under their belts, Scouts can start to actually build pioneering projects. Though the basic and oft-used A-frame can be readily completed using three square lashings, the shear lashing is most frequently chosen to start lashing together this common support structure. 1) The instructor shares the purpose and application of the shear lashing, explaining how we use it when we want to connect two spars and open them out to form the legs of an A-frame. 2) Scouts gather around the instructor who, using two Scout Staves and a 10-foot lashing rope, demonstrates lashing the ends of the staves together with a shear lashing, narrating each step as he does. The two staves are placed parallel to one another either on the ground, resting on a log, or leaning against a wall. 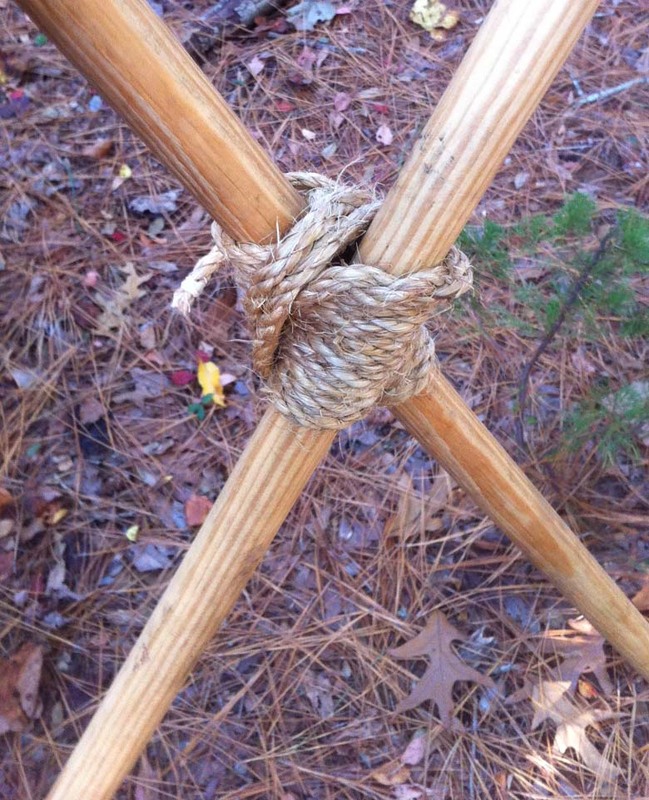 A 4 to 6-inch tail is left in the short running end, which is wrapped around the standing part serving to secure the clove hitch, before proceeding with the wraps. After the wraps, both staves can be held upright and spread a bit to make room for two tight frapping turns taken around the wraps and between the staves. The two legs are spread farther apart to form and inverted ‘V’ and the lashing is evaluated to determine if it is well-formed and tight enough to resist sliding. 1) When their shear lashing is adequately completed, each Scout is given a third Scout Stave and two 6-foot lashing ropes. 3) When all three lashings are well-formed and tight enough, each Scout should pick up the resulting A-frame and give it a shake, testing that it is indeed sturdy.